Fall is now here and that always makes the Gag Grouper fishing very good. Right now we are catching lots of gag and red grouper on both full and 1/2 day charters. 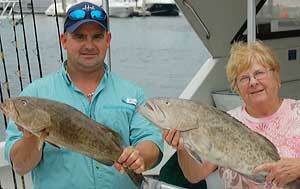 Grouper fishing will remain very strong through Christmas or until the water temps drop several degrees. A cold front coming through will cause the gulf waters to get a little stirred up and that will only make offshore fishing that much better. Naples Deep sea fishing charters are going daily from Port of Call Marina located in downtown Naples.